In the beginning of the 1980’s, I was forming rock bands all the time. At some point I was a member of 37 bands. Some were just a concept, a joke. I would meet two friends on the train going to Brussels, and we’d decide to form a band who would only play Casio mini synthesizers, and we’d call ourselves Los Casios. Next week we would make pictures and send it to the press to announce the start of the band. We never played, never did anything, we just existed. It was fun! So, I had many bands, and some of them actually made music. The most important was called à;GRUMH…, a bizarre name, and the style was industrial noise at first, and then became more electronic bloody music (also labeled “EBM”, “body music” or “techno” at that time – 1983 to 1988). In all these bands, I had stage names, all different. I was Steve Natrix, in another band I was Pliphon Nipiege, in another one I was Max, or Kruukuk Baallon, etc… and in à;GRUMH… I was Leon Noel. The logo of the band was created as a dart (triangle) with a circle in the middle. Later on, we decided to change the names of the band members to the first letter of the first name, then a number, then the first name in reverse. The idea was to show that nobody chooses his name: your last name is the name of your dad, and your first name was chosen by both your parents. In a way all the most important things of your life (where and when you get born, your name, when and where you die), you have no control of. To play with the concept of originality and conformism, we used letters and numbers, as the people would immediately say “oh but you’re just a number” and we could reply “you too, your name is just a code, a first name that anyone can have, and a last name which is the same in your family for hundreds of years, so what did you choose? I chose mine!”. As we didn’t want to have a #1, we decided that all 3 members of the band would be all #3 and so I became L3 NOEL. à;GRUMH… started making music more seriously in 1983 and a first record (on Scarface Records, later Play it again, Sam!) and we decided to have a tattoo on our arms with the logo and the number. 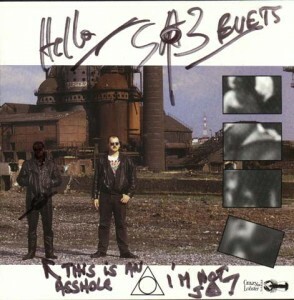 Then I decided that Leon Noel was a stupid name and I chose to switch to my favourite nickname, Steve Natrix, so I became definitely S3 eVETS, and I got a tattoo on my arm with the little dart and the number 3. The other members were P3 lACSAP and J3 sEUQCAJ. In a few years, the T-Circle got up to 46 members, not only in Belgium, but France, and also in countries like Canada, Sweden, etc… and it was a wonderful time of exchanges of ideas etc… The band released 17 records and tapes, toured three times all around Europe and twice in America, including a final tour in 1990 of 51 dates, 28 in the USA as top of the bill. We released video tapes showing these tours, if you’re interested they’re still available in our shop. We had a fan club, merchandising, even a special swedish club just for Sweden. We had articles in the New Musical Express, where we were single of the week in 1989, or in the Melody Maker, “LP of the month”, the reviewer even calling us “possibly the band of the decade”! 1981 to 1985, à;GRUMH… had performed in many concerts, all over Belgium and a little in France, using lots of very visual things, such as the use of animal body parts (pig head, pig liver (entire, kept in my pants for half the show, then released out, which made the press comment “he was lacerating his sexual organs that were bleeding out” – so silly) and later on steaks, chicken, beef and pig eyes cut out of heads, etc etc, to provoke and engage the audience. That had created a reputation of a powerful band on stage, provoking, fighting on stage, and many many legends and rumours that made our fame bigger and bigger. In 1985 we got our first record deal with Play it again, Sam! and we released the first MLP Mix Yourself! which got “pre sales”, something that had been “never seen” before for a band that had not released records (600 people ordered the record before it was released). Nice success, and then we did a second album Rebearth in the industrial/ambient style. It was our goal to pursue two careers, two styles, under the same name but with a different logo “round” helvetica bold for the rhythmic, electronic à;GRUMH… and a more gothic style for the industrial ambient à;GRUMH… (like on the cover of the Rebearth album). But that confused the fans, and Play it again, Sam! decided it was better to continue the industrial career under another name. nEGAPADRES.3.3. was born, album to follow in 1988 together with other productions on a label dedicated to this kind of music: Circle Records. In the meantime, à;GRUMH… continued releasing records, another EP (Underground), another LP (No Way Out), and in 1986 went on a first large-scale european tour as support act for Skinny Puppy. We thought nobody would know our songs outside of Belgium and we would have to conquer the audiences, but right away in Germany and Scandinavia, we saw we had lots of fans of our own, who were coming to see us, knew the lyrics, wanted to touch us, talk to us, get autographs, and even had tattoos of the band’s name in their very flesh! It was amazing to see how big our impact had been just after one year of record releases. We toured all over Europe, including former east Berlin, Yugoslavia, Hungary, etc. The tour lasted about 40 days. So when we went back on tour with the Kill tour in 1987, it was as top of the bill or double bill with bands such as Click Click or Severed Heads. 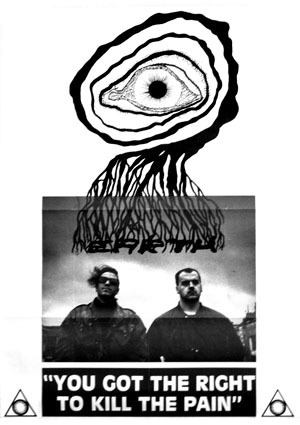 Again we toured all over Europe, for about two months with increasing success and following, and in 1988 we went back to Germany, Spain, France and for the first time to Montreal, Canada where the local rock club “Les Foufounes Electriques” wanted to have us. It was fantastic to be able to go to the american continent on request. Fans were there too, it was a great souvenir. After more studio releases, J3 decided to leave the band for personal family reasons. Our percussion player J7 cRAM-NAEJ took over the singing for the next tour. Play it again, Sam! decided to make a video for the song CBB and hired an english director. Although the song had J3’s voice, it was J7 that appeared in the video. We went to London to shoot it, for two days in a studio with the make up artist, a complete crew of 12 people, etc, but at the last minute disagreements between the director and Play it again, Sam! cut the budget, and the result of the video was so cheesy that I forbid its release. Then we embarked on our biggest tour ever, covering parts of 1989 and 1990, all over Europe again but as top of the bill everywhere, and to the USA and Canada for a 45 days / 28 dates tour with the italian band Pankow. We were supposed to alternate 1st/2nd on the order of play every day, but most of the organisers wanted à;GRUMH… to play second, so we were top of the bill on 22 or 23 dates in total. Also in the USA, except a few isolated dates, we encountered an audience waiting for us, knowing the lyrics, tattooed, we were clearly expected and wanted and it felt fantastic. After we came back that long 2-years tour, we wanted to release a live album. à;GRUMH… had another dimension on stage than on record, and I wanted that immortalised. So we took several weeks to listen to all the DAT recordings of each of the american shows to rate the songs for quality of sound, performance, energy etc… When this was done, Play it again, Sam! announced that they were not interested in releasing the live album now, and that they wanted a studio album first. I was very angry with this decision, the third disappointment after the video and the US tour… And somehow I was burned-out with making music, after the long tour, so many releases (17 records & CDs in four years)… I lost interest a little. But I still intended to make new music in the following months. But shortly after the end of the tour, my father passed away and i had to take care of my mother. My company started to take much more time than before, and I also created Girth and Mirth Belgium. I had no idea that the club would take so much of my time, but it did, and one year later, when I was supposed to go back to making music, I could never find the time to do it. Also each time we tried to make music with J7 it was impossible as he first would smoke two joints, drink and then make huge noises with his guitar for two hours and this is not the way I could build songs and compose. So we agreed that he would compose stuff on his own at home, and I would do the same, and we would then put things together and see what works or not. He never brought any music to me, and after a few last concerts in Germany in 1991 because of the insistence of our booking agency, he didn’t call or visit me, for no reason started to badmouth me, and we haven’t had any contact since then. I never understood why J7 decided not to be friends with me and became angry at me. Some common friends say that he thinks I stole his “moment”, that by stopping my own music career I also stole his chance of becoming a famous musician. My view of this is that, by taking him in the band on stage, and then offering him the lead singer role, I gave him a fantastic opportunity, and that he could have used that to build a career, but, by not producing or releasing anything substantial, he blew it. Everybody is free to lead his life and career as he wants, and I am in no way responsible for what J7 did not do with his like or music. Anyway, music became secondary in my life and then disappeared gradually. I believe there are times for everything, and music was almost 100% of my life during 1979 to 1990, so I did spend lots of time with it. Now it’s fireworks, movies, big men, gastronomy, wines, writing, and friends, and that’s OK that way too. I miss the tours, the fans, and the creative process. Maybe one day I’ll make a new à;GRUMH… record. Who knows ? But since J3 and me became best friends again in 2000, we have started working on nEGAPADRES.3.3. material and we released a new album in 2006 Exstrophy of Amphigouris, which got an enormous critical acclaim in the industrial milieu. We got compared to Zev, Throbbing Gristle and bands of that importance. It brought us lots of pleasure to see how the people reacted positively to our music and we continued working and now have two new albums finished, La Phobie du Cheval, to be released in 2010, and later another album Binche, both on Hermetique Records. On the Binche album, one of our guest musicians is John Ellis, former guitarist of Peter Gabriel, The Stranglers, The Vibrators, Peter Hammil etc. I was very proud that John, that I met as a rock journalist back in 1982/83, liked our album that much and offered to participate to it. 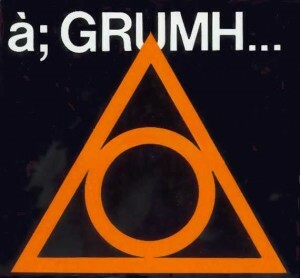 Great to read the story about à;GRUMH… I’ve been a fan since the mid 80s and saw you perform live in Stockholm, Sweden. Those were the days.. I was one of the lucky few to see you play with Pankow in Tulsa, OK, USA. I remember you opening with audio clips of Monty Python, and later, J7 throwing up on stage- and not as part of the show! I’m impressed with the honesty with which your transcribe your band history and your feelings regarding it… and I”m very happy you’re still with us today and still look fondly on your experiences! @Mike, Thanks for such a great comment ! We remember Tulsa very well, did you come to talk to us after the show ? I was there at Les Foufounes Électriques when you performed, one of the greatest shows I have ever been to. One of my friend who was there too still talks about it more than 20 years after. Thanks SOJA and FRED for the great souvenir posts 🙂 So glad our music and even existence has left you with great memories ! Siempre me habéis rayado con vuestra música de estratorferica loca y divertida y a la vez con mucho sentimiento de nostalgia .gracias millones de gracias.